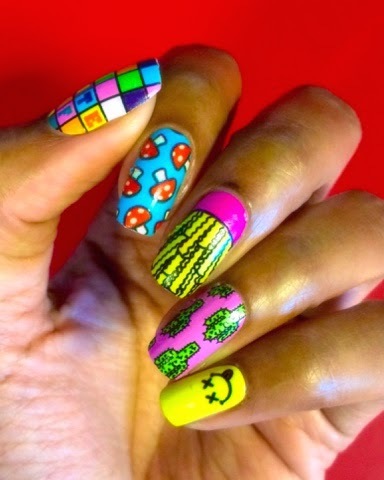 A Miami girl's blog about all things nails, art, dance, and life! 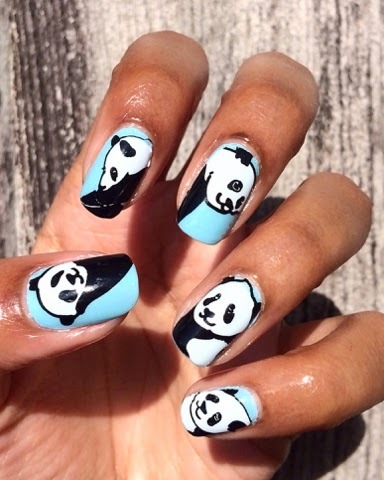 Scratch "Lazy Pandas" nail wraps over NCLA nail polish in "Sweet Baby"
I'm finally able to take a moment to put a new post together for you. 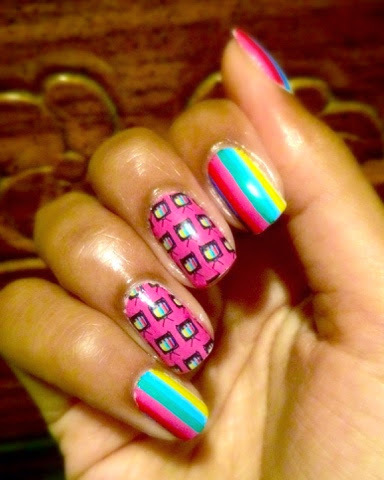 I did my nails right before bed last night, and just love how this mani came out. 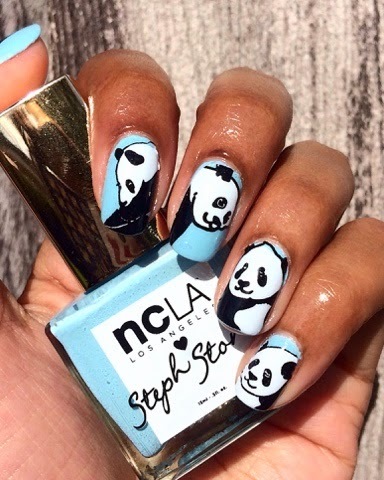 I decided to paint on a couple coats of Steph Stone's NCLA collab nail polish in "Sweet Baby" and layer some super cute panda bear nail wraps from Scratch on top. Check out the pics below! Cute, right? The nail wraps worked great as usual, but it had been a while since I've used an NCLA nail polish. I was happy to see how quickly each coat dried, and that I didn't have to wait too long to apply the nail wraps over it. I like to give the polish at least fifteen minutes to dry, but sometimes it can take a bit longer. The last thing you want is for the nail polish to smudge while you're applying nail wraps on top, so giving it a bit of time to dry is key. Follow up with a thin coat of top coat, and you're all set. 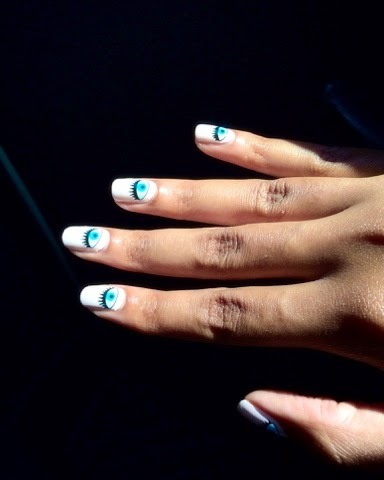 Scratch Nail Wraps in "All Seeing Eyes"
What do you think about these nail wraps? Would you wear something like this? 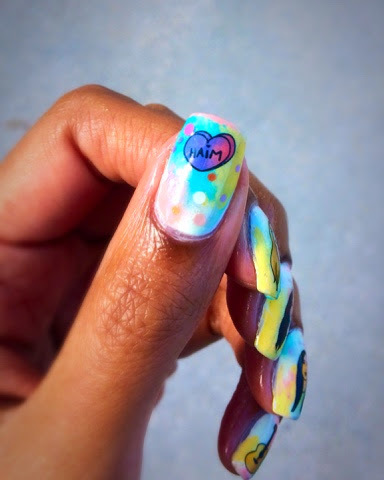 See ha with a new post later this week! When I first used NCLA nailw wraps a couple of years ago, the wraps were a little on the thick side, and not very pliable. I'm happy to see that they have made an improvement with the flexibility so that people with curved nail beds can wear them much easier now! 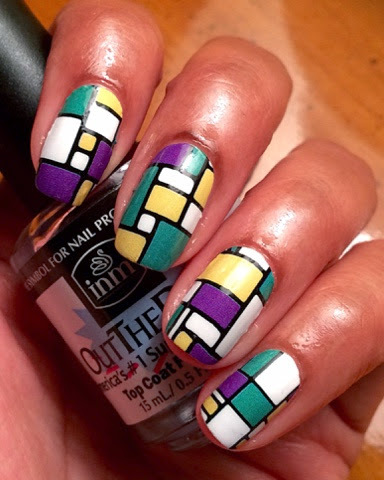 Out of all of the nail wraps that I've tried that are not made of nail polish, I would say that the NCLA kind are the most curved nail bed-friendly out there. Incoco Nail Polish Strips in "Spring Fling"
I had a great, relaxing week at my grandparents' house, and now it's back to my usual Miami city life. 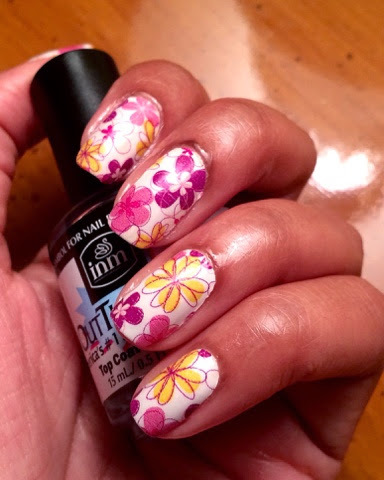 I put on these super cute floral nail polish strips from Incoco, one of my favorite nail appliques brands. 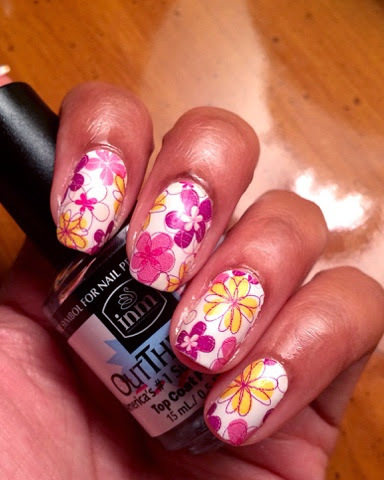 Check out the photos below of the design called "Spring Fling". As usual, I start out with my favorite base coat (Top 2 Bottom by Orly) and finish off with Out The Door from INM; which you see me holding in the photos. This combo has been working for me for so long, and it keeps my manis together long enough while I'm in between looks. 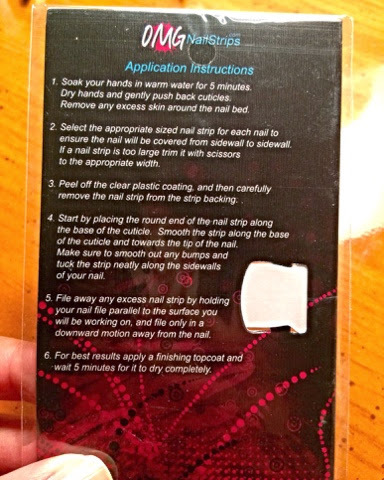 I am pretty much following the instructions that are given on the back of each pack of nail strips, with a bit of the techniques I've become accustomed to over the years on my own. This is only my second pictorial so I hope it is easy to follow along. 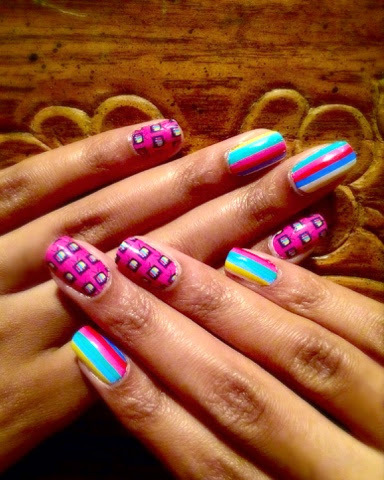 Check out the how-to below, and the super cute design called "Kapowski". I like to use a base coat every time I give myself a manicure, even with nail trips. 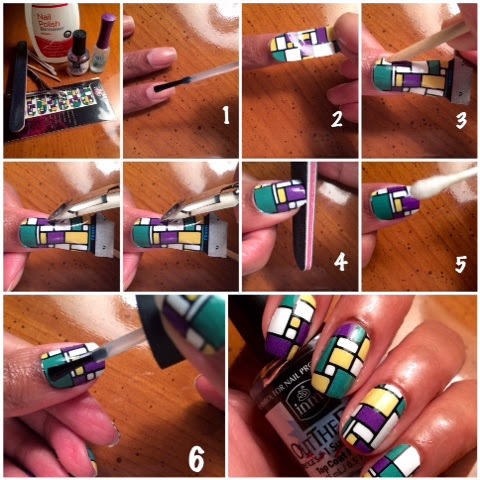 As you see in step 1, I am applying my favorite (Orly top 2 bottom), and letting it dry before I continue. Step 5 might seem little off, but I wanted to try something that the guys from OMG used to suggest from the beginning, and that's going over the nail strip with a bit of acetone. I used to stay away from this step when I used these nail strips previously, because I was worried about wiping off some of the color. I decided to try it by using regular everyday nail polish remover (not the pure acetone type), and using a q-tip to swipe a little bit over the nail strip. It is believed that this will help the nail strip flatten out and adhere to the nail better, and from what I can see, it does help. 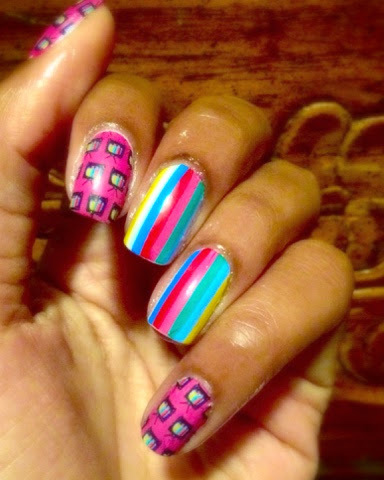 I don't think this step is a must, as I use nail strips all the time, and never do this. I'll just say that it's completely up to you! 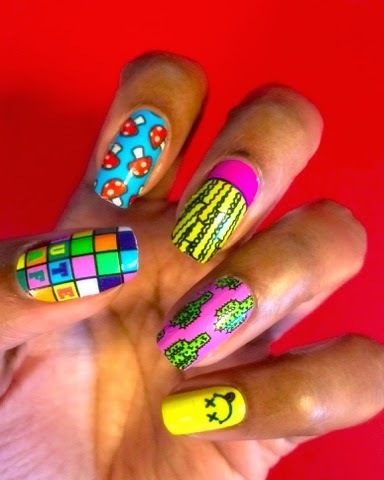 Finish off your mani with your favorite top coat to seal everything in. So, what do you think? 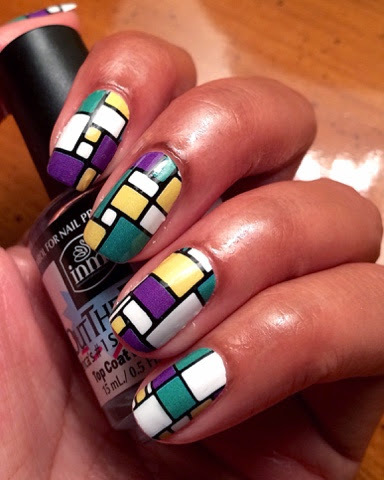 I love the color combinations and this geometric pattern. I plan on keeping this on for the rest of my trip! So what do you think about this look? 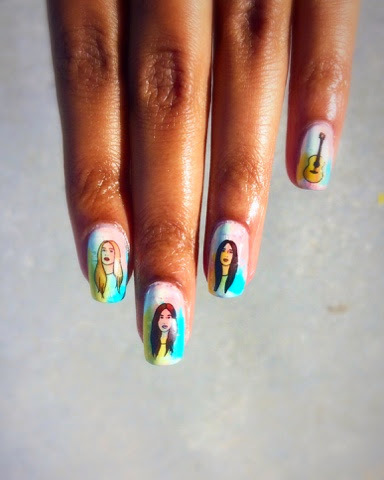 Do you like any songs from the Haim sisters? See ya next time! I managed to squeeze in one more manicure before my long work week takes off. Given that I love Sara M Lyons nail art decals, and needed something that would last on my nails for a bit, I thought going with her full coverage nail prints would work the best. 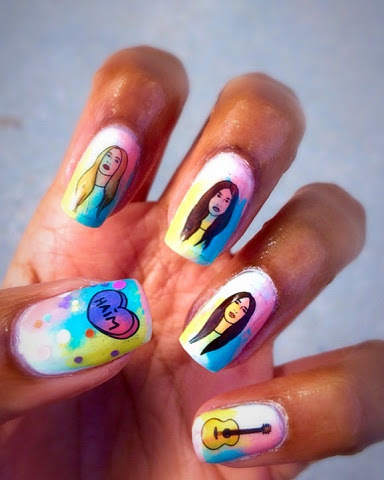 I know you guys just saw some of her decals in my post from Monday, but there's something about her quirky designs that just make me happy to look at my nails constantly, and show them off to others...lol ;) So, I have some "TV Party" nails to show you. Check out the pics below. As recommended, I painted my nails with a coat of white polish before hand, so that the decals could pop more once applied. 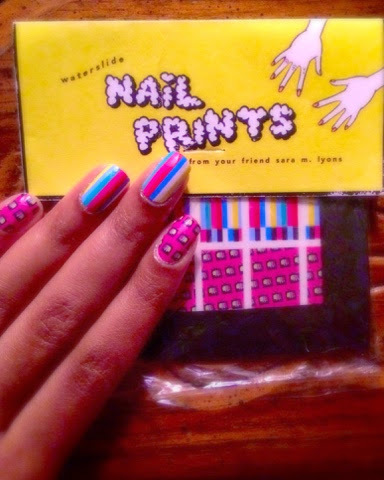 You put these on just as you would apply any water slide decals. The only difference is that they are full coverage, like nail wraps.Once you've applied the nail prints, just seal with your favorite top coat, and you're good to go! I absolutely love how these came out!